Career specialist Dayana Cabeza showed LVA students with foreign-earned credentials how to succeed in the U.S. job market, during a student support workshop this month. For an adult struggling to learn to speak, read or write English, seeing your words appear in print can be a tremendous boost to your confidence. 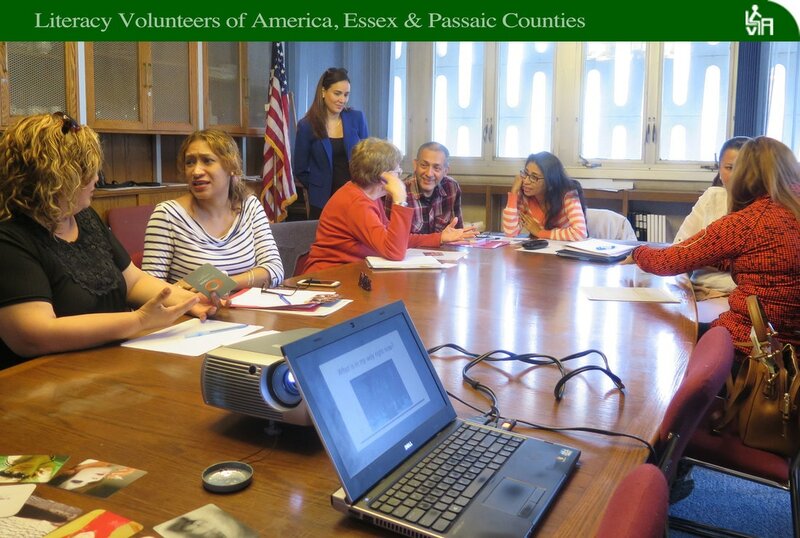 That’s precisely what happened to LVA student authors Barry Batts, Beralia Briceno, Fernanda Contreras, and Clifford Henry, along with students of other Essex County Consortium organizations. Their stories and poetry are featured in the newly-published book, “Journey Near and Far, A Collection of Memoirs, Poetry and Intrigue,” by Hard Ball Press. Barry and other students will read and discuss their work at Essex County College on Thursday, May 18, from 10 am to 12 noon, at the college’s 3rd Floor Green Area Snack Bar. “Journey Near and Far” can be purchased through Amazon and hardballpress.com. A limited number of copies will be available for sale at the event. Congratulations to Barry, whose writing also appears in the 2016 NJALL Learner Writing Contest magazine “INSIGHT,” and to all of the other authors! Maritza Chang is on fire! The Peruvian native, winner of LVA’s Essex County Student of the Year award last year, was honored by Literacy New Jersey last month with a “Student Excellence Award.” Her story is featured in Essex News Daily, Belleville Patch, and on Page 4 of this e-newsletter. ‘Adult education leaders working to increase career readiness for America’s adults meet with new Education Secretary and Congress to seek support,’ Business Wire. Damian, an LVA student in Essex County, has overcome serious obstacles on the path to literacy. Damian is rapidly checking off items on her list of personal goals. There’s reading, there’s writing, and there are dreams, like this: Early next year, the LVA basic literacy student will be a published author. It is the result, as well, of Damian’s meticulous work with tutor Margaret Valentine, with whom she meets for four hours each week. “I am hungry to learn,” Damian said. Damian lived in Jamaica where she said she was pushed along the school system through the 8th grade. “I didn’t grasp anything at all, but they let me go through,” she explained. A short time later, she enrolled in a trade school where she learned to sew, cook, and babysit. At age 14, she left Jamaica and moved in with an aunt in New Jersey. She took a job as a babysitter, still not knowing how to read and write. Eventually, she said she made some hard decisions about her future.
. “I said, ‘Ok, I need to do something about myself,’ ” she recalled. She found little help in evening classes she enrolled in, then made her way to Literacy Volunteers of America. That’s when things started to click. “I am on the journey now,” she said. Her enthusiasm and energy seem endless, and they’ve undoubtedly helped her past some of life’s obstacles, among them a serious health issue. “I had a kidney problem but did not let it hold me back,” she said. “I scheduled my dialysis so it did not affect my classes.” After a long wait, Damian’s name finally came up on the transplant list and soon she was in surgery. “I got a kidney transplant and am back in class again,” she said, quite matter of factly. “I wasn’t going to let my sickness define me.” Add another big checkmark to Damian’s list. One day he grabbed for the sports page of the newspaper so his cellmate could read it to him. Accidentally, he picked the stock page. This was how he came to learn where folks save their money. It gave him hope but he needed to learn how to read and write. Curtis “Wall Street” Carrol gives an inspiring narration on how he came about to earning right from the walls of prison. He recalls an encounter that led him to a juvenile facility as a 14-year-old boy. He was trying to steal an arcade game when the watchman caught up with him, maybe because the book was too heavy. After being released to his mother’s custody, the first question from his uncle was how he could allow himself to get caught. He grew up in a family deeply addicted in cocaine. He grew up with the intuition that money was the king. The fact that he could neither read nor write gave him the impression that crime was his only way out of poverty. He did not care about the society, especially after seeing his mother sell her blood for $40 in order to fend for her kids. He had to get money by whatever means necessary. At 17, he was arrested for murder and robbery. This was another learning moment, money rules in prison more than in the streets so he had to join. One day he grabbed the sports page of the newspaper so his cellmate could read it to him. Accidentally, he picked the stock page. This was how he came to learn was where folks save their money. It gave him hope but he needed to learn how to read and write. To watch Paul Lieberman in action, the way he commands the attention of a group of adult ESL students each week, is like watching a teacher with tons of experience. But a year ago he had none. Perhaps his success as an LVA tutor at the Bloomfield Public Library is the result of his work ethic, a trait he developed as an entrepreneur. He ran a family business started by his grandfather in 1910 and he kept it thriving until his 2015 retirement. Or his honesty, another requirement for a business with a loyal base of customers. Whatever drives him, it’s working; his students are making progress. Paul is as conscientious about learning as he is teaching. He is a return student in Montclair State University’s OLA (Older Learning Adults) program, a reduced tuition program for New Jersey residents 65-years and older who have lived in state for at least five years. It’s nearly 2 a.m. and there are way better places to unwind than a dining room chair in your apartment, eyes glued to the English textbook in your lap. But, for Maritza Chang, there’s no better time or place for an immigrant mom bent on becoming fluent. “The kids are sleeping and there are no interruptions,” said Maritza, a child psychologist from Lima, Peru, and now an LVA student. “It’s better.” The grueling hours of study have done well by her. She went from being lost in everyday English conversation to making a presentation in English at the NJALL annual conference last year, given on the LVA English-Spanish Language Exchange that she coordinates as a volunteer. She was hired to work the front desk at the Bloomfield Public Library, often the first stop for patrons with questions. And she led a delicate but firm negotiation with her town’s school district in a campaign to keep her two daughters in their neighborhood school, despite the district’s attempt to move them to one designated for ESL students. “The district not only kept the girls in their original school but began a small ESL program there, where the girls quickly became fluent in English,” Literacy New Jersey board member Christine D’Agostino said, as she presented Maritza with a Literacy New Jersey “Student Excellence Award,” at the organization’s Literacy For Life 2017 conference last month. A second Student Excellence Award was presented to Justin Farro, and the Award for Tutor Excellence was earned by Susan George, both of Literacy Volunteers of Monmouth County. Literacy Volunteers of Salem/Cumberland won the 2017 Alice M. Leppert Award for Outstanding Affiliate Achievement. The Harry Van Houten Award for Lifetime Achievement was presented to Perrine Robinson-Geller, former board president of Literacy New Jersey, a much-in-demand workshop presenter, and a lifelong advocate of adult literacy. Nice work by all!